chris_stop_her_ She Loves It! "Gold on Black! It Looks Amazing!" scott450 - Beaverton, MI Nice Visor! "I bought this as a replacement for my clear shield. 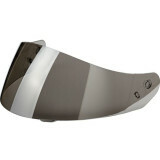 Slight tint makes riding on bright days much easier"
Founded in 1971, HJC specializes in motorcycle helmets exclusively. HJC prides itself on providing safe, comfortable, stylish and affordable helmets. Apparently the motorcycling public has caught on. After HJC stepped up quality control in the 1990s, HJC motorcycle helmets vaulted to the top and the company's self-proclaimed title "#1 in the World" is with good reason. HJC offers a wide selection of motorcycle helmets in the low-, mid- and higher-price range. HJC motorcycle helmets undergo constant testing in the laboratory and "real" life. HJC is one of the few helmet companies equipped with its own wind tunnel testing lab to measure aerodynamics, ventilation and noise. Most notably, in 2010, HJC introduced the RPHA 10 full face helmet featuring a light weight shell with a center locking mechanism, aerodynamics and comfort. The RPHA 10 helmet offers high-end features at a price the everyday rider can afford. Also a best seller, the IS Series of HJC motorcycle helmets comes with an interior sunshield system utilizing a solid central track mechanism to open/close the interior sunshield in an instant. MotoSport offers a full line of HJC motorcycle helmets and accessories. We carry full face, half shell, modular and open face helmets. The IS Series is available in all four categories and the RPHA 10 comes in full face and modular. The CL-16 and the CL-MAX line of helmets give high-end performance for the budget conscious rider. 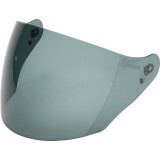 We also carry an extensive collection of replacement visors and face shields. MotoSport is the best place to find HJC motorcycle helmets and accessories. We provide a 90-day return policy and most orders ship same day. Use the size charts to help you take the guess work out of selecting your product. Even if a product doesn't fit, our hassle free return policy means we make it easy for you to get the right one. Want help? Call our toll free line 866-677-7338 or chat with an expert.